Young women, most in their 20s, lie on the floor like corpses at a community health centre (CHC) in Bikaner’s Kolayat block in Rajasthan. Flies hover over the bandages on the fresh wounds they received after undergoing operation for sterilisation. As they lie unconscious on a thin mat spread on the floor, relatives use cardboard pieces to fan themselves, and at times the patients. With temperature lingering close to 40°C, one cooler in the room is insufficient. Small children play with their slippers and feeding bottles and other belongings close to their mothers. Even as the women suffer the government health service, S M Sharma, the deputy chief medical officer (CMO) of the district, is thundering at a bunch of nervous health workers in the next room: “If you do not bring at least five cases each by June end, I will initiate probe against you and personally issue you a notice,” he says. The health workers had failed to persuade enough women to go under the knife for sterilisation. Sharma was angry as only 34 women had come for the surgery. After the initial haemoglobin and pregnancy tests, the number had reduced to 24, too less for the CHC. “On May 23, as many as 72 women were sterilised,” proudly says Anil Verma, CMO at Kolayat. Forty-two women were operated on April 25 in the hospital, 20 on April 4 and 24 on May 2. Not more than 30 surgeries can be undertaken in one camp, state the guildelines set by the Ministry of Health and Family Welfare in 2008. Beds with mattresses and pillows are a must. Clearly, the guidelines are being flouted. Verma says there is no money for infrastructure. “Even the mats the women are lying on are donated,” he says. Couples who opt for sterilisation are not counselled about the available family planning methods like condoms, oral pills and intrauterine devices. The National Population Policy 2000 stresses on “informed choice” of citizens while availing reproduction healthcare services and “target-free approach in administering family planning services”. It thus seeks to put an end to coercive sterilisation and target-based approach to family planning. But health officials are in a rush to please their seniors, and ignore healthcare in the process. To assess the quality of care given to women who undergo surgeries, Manjri, a non-profit in Nainwa block of Bundi district, along with the Centre for Health and Social Justice, a Delhi-based non-profit, conducted a study in Nainwa in 2010. They interviewed 749 of the 954 women sterilised in the block in 2009-10. They found that only 12 per cent were counselled about the available choices of contraception. Forty-two per cent women were not counselled about the permanency of sterilisation. Eighty-eight per cent were not told about failures or complications. Of the 11 mandatory physical examinations before the surgery, only three, for haemoglobin, blood pressure and pregnancy were conducted. Almost all the women were discharged within four hours of surgery. Eight per cent women said they were still unconscious when discharged from the hospital. Some regained consciousness the next day. As per the health ministry’s guidelines, a patient can be discharged four hours after the surgery if his or her vital signs are stable, is fully awake, has passed urine and can walk. It also found that 2.5 per cent women became pregnant despite the sterilisation operation. The international standard is 0.5 per cent, the study says. “Till date, no action has been taken against the erring doctors in Rajasthan,” admits Vinod Atrey, project director, family welfare at the state health department. “But we have started preparing a list of offenders,” he says. What’s worse, very few women get compensation. Last year, of the six women whose operations failed in Jhajju village in Kolayat, only one received Rs 30,000 as compensation. 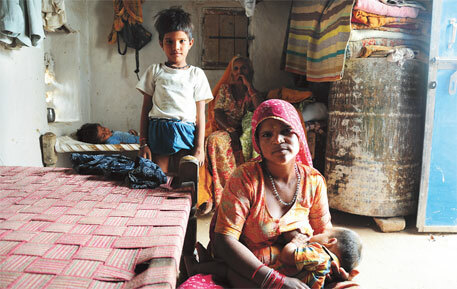 Jaishu Devi, 23, underwent operation four years ago. She has given birth to two children after that. Married at the age of 15, she had three children before the operation. Illiterate, she does not know she should collect a certificate that proves that she underwent surgery, which could help her get compensation. The situation is starkly similar at health centres across the country. On the night of January 7, a doctor operated upon 53 women at a school building in Araria district of Bihar. The school, which lacked basic amenities like running water and sterilisation equipment, was the venue for a sterilisation camp. After the doctor left the camp, there was no hospital staff to attend to the patients. Nineteen days later, a pregnant woman, who was also operated upon by the doctor, had a miscarriage. Several others complained of bleeding and had to seek medical care later. This was widely reported in the media. In February, a woman from Balaghat district of Madhya Pradesh bled to death when doctors tried to sterilise her and found on the operation table that she was pregnant. Such cases prompted health activist Devika Biswas of Patna to file a public interest petition in February in the Supreme Court. She has made all states party to it and highlighted that across the country sterilisation camps are held in violation of the health ministry’s guidelines and the National Population Policy 2000. At a recent hearing on July 5 on Biswas’s case, no state apart from Sikkim responded. “To me, this shows that states are not taking the matter seriously,” says Kerry McBroom, director, reproductive rights unit at Human Rights Law Network, a collective of lawyers and social activists. Health officials are in a tearing hurry to reduce the country’s high Total Fertility Rate (TFR), or the average number of children a woman bears, from 2.5 to 2.1. At the receiving end of this rush are the women in central India where TFR is high—Rajasthan and Madhya Pradesh have 3.3, Uttar Pradesh 3.8 and Bihar 3.9. Brushing aside laws and policies, they set targets. Health workers—accredited social health activists (ASHAs), auxillary nurse midwives (ANMs) and anganwadi workers—are given the task of persuading men and women to undergo laparoscopic surgeries. At every CHC meet, health workers are given the number of people they must bring for sterilisation. The number is reached after annual surveys conducted door-to-door by them. This year, Bikaner has 419,189 couples eligible for contraception. Of this, only 19,408.45 couples want permanent contraception. The Rajasthan health department has set a target of 24,164, more than one per cent of Bikaner’s population. The targets have increased over the years, and officials cite no particular reason for this. Atrey has a politically correct term for the targets. “Each year, we have Expected Levels of Achievement (ELAS) which tell how many people have to be motivated. Setting ELAs does not mean we use coercive methods,” he says. “The targets are unrealistic,” accepts Verma even though he continues to push for achieving them. They should be what come out in the annual surveys, he says. Each ANM must bring not less than 20 people in a year, an ASHA 12 and an anganwadi two. Even Ayush (ayurveda, yoga, unani, siddha and homeopathy) doctors are given targets. They have to bring not less than 10 people. It is difficult to motivate people. “Women don’t talk to men about such issues and men would not talk to female health workers,” says Ghanshyam Ramavat, chief medical officer at an ayurvedic hospital in Jhajju. This is also the prime reason most operations are done on women. Most health workers are women. “We face so many problems and when we are unable to meet targets, our seniors scold us,” says Ramavat. He convinced nine people to get operated in 2007, 15 in 2008, eight in 2010 and only four in 2011. He is nervous because this year he does not have any case. Many people demand contraception. “But why should sterilisation be the only answer?” asks Dinesh Agarwal, programme director of reproductive health at United Nations Population Fund (UNFPA). Couples should be counselled about all the options. Stopping sterilisation is also not the solution, say civil society groups. The need is to make quality assurance committees functional in each district. These three-member committees are supposed to ensure that the standards for sterilisation laid down in the guidelines are diligently followed. At present, these committees do not exist in many districts. To meet the family planning needs of developing nations, the UK government’s Department For International Development, along with Bill and Milinda Gates Foundation and UNFPA, will host a summit on family planning practices in London on July 11. It will discuss ways to increase access to family planning to poor countries. But civil society groups fear that post-conference, there will be added pressure on countries like India and China to reduce population. “States will then intensify their coercive methods of sterilisation. These countries have a big young population. It will take time for them to stabilise their population,” says Leena Uppal, advocacy officer at national coalition against two-child norm and coercive population policy in India. Achieve target by hook or by crook....women being treated as animals.Failure of Health Delivery System. Wanted to add that I think to some extent men are unwilling to undergo surgery simply because they see it as a threat to their manliness (not verified but I've heard that vasectomies are less invasive and painful than female sterilization surgeries). This is a public health and a gender issue- it seems unfair that such a disproportionate amount of women undergo this procedure and it's unfortunate also they they aren't given proper treatment at all points of the operation. I think the statement about the fact that most health workers are female and therefore there isn't interaction with men given as the prime reason for women receiving surgery shows the gender inequality in addressing the population issue. Why aren't male health workers called on to advocate for men having vasectomies? The article reflects the collective failure of the whole policy making and implementing structure of India.While deciding on any targets,the policy makers should review and make sure that targets are realistic,sensitive to people and should serve the very purpose for which it is being framed.Even the well educated doctor's desire to attain target infuriates me.How insensitive can we grow?While policy framers decide guidelines that appear very idealistic, no steps are taken that these "idealistic" conditions are implemented successfully.I feel really bad that this happens with the poor and innocent people of my country.When will we change and stop treating human insensitively. I am shocked to know about the situation in BikanerÃ”Ã‡Ã–s Kolayat block in Rajasthan. I donÃ”Ã‡Ã–t understand why sterilization is done in such unhygienic surrounding. Health organization needs to think seriously about this issue and take necessary action.